A well drafted and implemented estate plan can accomplish a wide range of inter-connected goals. Knowing that, selecting an estate planning attorney to help you wish that plan should be done with care. 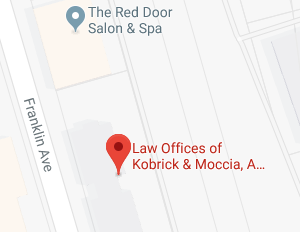 At Kobrick & Moccia, we are dedicated to helping our friends and neighbors in the Lynbrook, New York community with all of their estate planning needs. Moreover, we are committed to building a lifelong relationship with each client in order to best serve their estate planning needs today and in the years to come. The Village of Lynbrook, New York lies inside the Town of Hempstead in Nassau County. Encompassing just two square miles, the population of Lynbrook was 19,427 at the 2010 Census. The history of Lynbrook dates back to 1785 at which time the area was a small farming community of just 40 families. Once known as Rechquaakie, Near Rockaway, Parson’s Corners, and Bloomfield, the Village of Lynbrook was also named Pearsall’s Corners after Wright Pearsall’s General Store. The General Store was a well-known stage coach stop for travelers making their way from New York City to Long Island. The location of the stage coach stop at the crossing of Hempstead Avenue, Merrick Road, and Broadway also led to the village once being known as “Five Corners”. It’s current name of Lynbrook came about in 1894 as a tribute to the original home of many early residents of the village. “Lynbrook” is derived by dividing “Brooklyn” into its syllables and transposing them. The Village of Lynbrook was officially incorporated in 1911. By creating a comprehensive and cohesive estate plan today, you can rest assured that everything and everyone that matters to you will be protected for many years to come. The estate planning attorneys at Kobrick & Moccia are committed to helping our friends and neighbors in the Lynbrook, New York community create an estate plan that protects and grows your assets while you are alive as well as ensuring that those assets continue to provide for loved ones when you are gone. Nurturing the relationships we have with our estate planning clients is a priority for us because we firmly believe that the most successful estate plans are those that are continuously reviewed and revised to ensure they address today’s current needs, goals, and concerns. The changes that occur in your life will precipitate corresponding changes to your estate plan to ensure that your estate plan remains relevant. Initially, a simple Last Will and Testament may suffice to ensure that you don’t leave behind an intestate estate in the event of your sudden death. As both your family and your estate grow, however, your estate plan will need to be updated to take those changes into account. Marriage, for example, may prompt you to want to add your new spouse as a beneficiary and/or a fiduciary within your estate plan. The birth of a child will trigger the need to protect your minor child’s inheritance through the addition of a living or testamentary trust to your overall estate plan. Having a family should prompt you to worry about the possibility of your own incapacity and the need to include incapacity planning in your overall estate plan as well. The growth both in size and value of your estate assets may also call for the inclusion of asset protection as well as probate and tax avoidance strategies to your plan. Looking toward your retirement years may prompt you to incorporate long-term care and Medicaid planning into your estate plan as well as merge your retirement plan with your estate plan to ensure they work well together. It may also cause you to consider your feelings on end of life medical treatment as well contemplate your own funeral and burial. If you have strong feelings or beliefs about either end of life medical treatment or the disposition of your body after you are gone, there are estate planning tools and strategies that can be used to ensure your wishes on either, or both, subject are honored. The estate planning attorneys at Kobrick & Moccia would be honored to help you create and update your individualized estate plan to ensure that everything and everyone that matters to you is protected. If you have specific questions regarding your estate plan, contact an experienced Lynbrook, New York estate planning attorney at the Law Offices of Kobrick & Moccia by calling 800-295-1917 to schedule your appointment.